Today is the first Friday of Lent, so I’m kicking off my annual Lenten project – sharing meatless meals every Friday. What began as simply a way to keep from eating plain spaghetti and pizza every Friday has grown into one of my favorite yearly blog projects. But, nine years on, how do I keep this series fresh? I’ve spent a bunch of time thinking about our family’s current needs and how to get them to reflect in my meatless Friday posts. Today is Good Friday and the last installment of the Lenten dinner series for the year. And I saved the best for last. One of our local pizza places makes a salad pizza – it’s basically a warm crust with a garden salad on top and it’s amazing. This is pretty much the Greek salad version of that. There’s something amazing about the contrast of the warm, melt-y feta against the cold crunch of the vegetables. Seriously, if you don’t already have dinner plans, you need to make this tonight. In the interest of speeding things up (because I have zero patience on Friday nights), I used a pre-made pizza crust for this. You could also use your favorite pizza dough and just bake until the dough is golden brown – probably a few extra minutes. Whisk together the olive oil and garlic and brush over the prepared crush. Sprinkle the crust evenly with oregano, basil, thyme, salt, and pepper. Top evenly with mozzarella and then feta. Bake for 15 minutes, until the crust is golden. Immediately top with red bell pepper, grape tomatoes, olives, onion, and parsley and serve. I’m sure none of my long-time blog readers are surprised to see that pizza has made it’s way into the Lenten dinner series. I’m a pizza fan. It was bound to happen. The beauty of these is – like pizza – you can top them however you want. If it wasn’t Lent, I would have added some pepperoni on top. Ham and pineapple would also be good. These are a great idea if you’re looking for a meal that will please both vegetarians and non-vegetarians alike! In a small saucepan, combine quinoa, water, and salt. Bring to a boil and then turn heat to low and cook for 14 minutes. Remove from heat and fluff with a fork. Combine cooked quinoa, tomato paste, spices, and mashed beans. When well combined, divide into six equal parts and form into patties. Spray a skillet with non-stick spray and cook patties over medium heat until both sides are browned and patties are heated through. Top with 1 Tbsp. pizza sauce each and a slice of mozzarella cheese. Cover and let cheese melt. Meanwhile, spread melted butter over the cut side of the buns and sprinkle evenly with garlic powder. Broil until toasted. 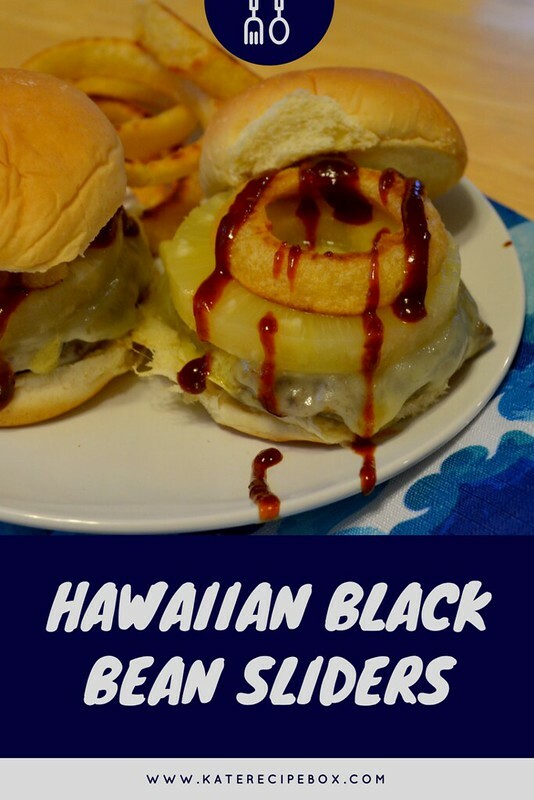 Serve burgers on toasted buns immediately. We’re officially into the phase of Lent where meatless Fridays feel like a chore. The new meals I was most excited to make have already been tried out and I’m trying really, really hard not to just fall back on pizza and fish sticks. This meal was a bit of a compromise. I had something veggie-packed and healthier planned – but cheesy comfort food sounded much better for the night. And it was. We topped leftovers with grilled chicken and pulled pork for lunches the next day – both were great! In a large skillet, heat the olive oil until shimmering. Add the garlic, onion, and pepper and cook until onion is soft and translucent – about five minutes. Add in rice, corn, black beans, enchilada sauce, green salsa, and spices. Mix until well combined and cook for an additional five minutes, until everything is heated through. Sprinkle the cheese over the top and cover. Cook until cheese is melted and serve immediately. Welcome to the 2017 Lenten dinner series! Every Friday during Lent I’ll be posting a meatless meal idea. This series was born out of my desire to do something other than order pizza on Lenten Fridays, and it’s resulted in some of our favorite meals. I picked a really quick and easy meal for our first Friday because, if you’re anything like me, this totally snuck up on you and you’re scrambling. These are perfect for nights like that – they take about 5 minutes to prep and only 15 minutes to bake. I threw some chips and salsa with this and it was a great, no-fuss meal. In a bowl, combine the pinto beans, onion, bell pepper, vinegar, salt and pepper – gently mash until the ingredients start to come together. 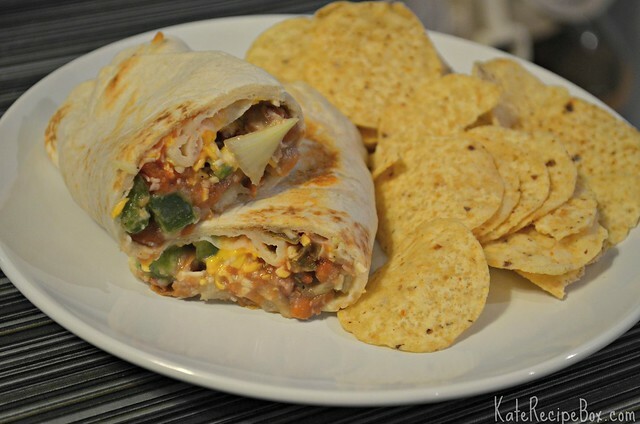 Divide the filling between tortillas and top with cheese and salsa. Roll up, and wrap in a piece of foil sprayed with nonstick spray. Bake at 400 degrees for about 15 minutes, until heated through. 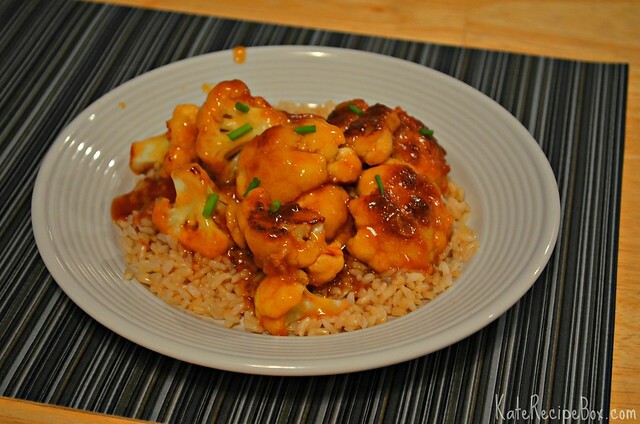 Another Lenten dinner, another vegetarian take on Chinese takeout. I actually liked this a little better than the Kung Pao Chickpeas I shared few weeks ago for one reason – it’s a from scratch sauce. There is nothing that annoys me more than finding a bottled sauce you like only to have the company discontinue or change the recipe a few months later. 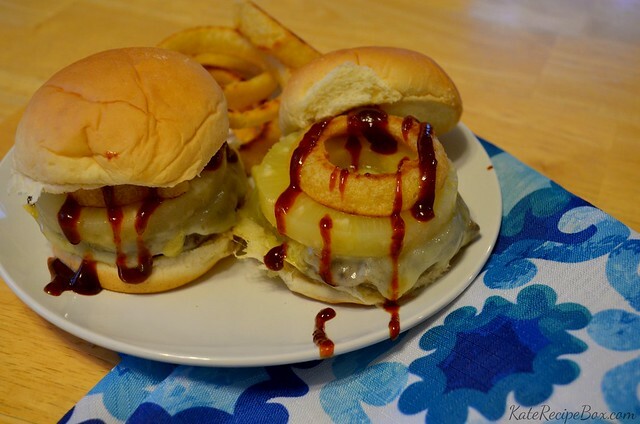 Falling in love with a from-scratch sauce is easier. It will never desert you. I’ve tried a few General Tso’s sauces before, but this one comes closest to the Chinese takeout we’re used to. I’ll definitely be trying this again with chicken at some point. In a large bowl, whisk together the 2 tsp. sesame oil, egg, 1/3 cup cornstarch and 3 Tbsp. soy sauce until well combined. Add the cauliflower florets and toss until thoroughly coated. Set aside to marinate for about 20 minutes. After marinating, heat 2 Tbsp. oil in a large skillet and add cauliflower. Fry cauliflower until evenly browned on all sides. Remove from heat and set aside. In a separate pan, add the 1 Tbsp. sesame oil and olive oil. Over medium-high heat, sauté the garlic and ginger until fragrant, about a minute. Add in the vegetable stock, 1/3 cup soy sauce, 2 Tbsp. cornstarch, chili garlic sauce and brown sugar. Cook until it comes to a low boil and has thickened. Add the sauce to the cauliflower and toss to coat evenly. Serve over rice, topped with green onions. 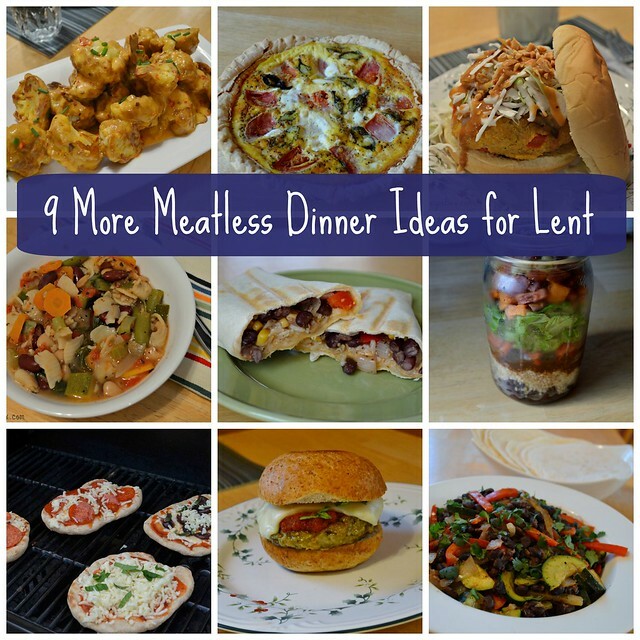 Find my updated list of Meatless Meals for Lent here! Sharing meatless meals on Fridays during Lent has become my favorite blog series over the years. I love finding new things to try and love hearing that the ideas help others break out of the stereotypical pizza or pasta with tomato sauce rut. And the annual Ash Wednesday post rounding up some of my favorite meatless meals from the previous year has been some of the most popular posts on my blog. Today is Ash Wednesday so, of course, I’m sharing the annual round-up. And Friday will kick off the Lenten dinner series for this year. If you’re looking for additional dinner ideas, check out my previous posts: 16 Meatless Dinner Ideas for Lent and 16 More Meatless Dinner Ideas for Lent.